Issue 2 of SRSP-303.65 has been released to update Section 9, which outlines a licensee's international coordination obligations for the sharing of the 3650-3700 MHz frequency band along the Canada-United States border regions. These technical rules form the basis of the frequency sharing arrangement concluded with the United States for this band; final adoption of this arrangement is subject to the treaty adoption processes of both Canada and the United States. 1.1 This Standard Radio System Plan (SRSP) sets out the minimum technical requirements for the efficient utilization of the band 3650-3700 MHz for WBS. 1.3 The Department will allow a full range of fixed and mobile applications (e.g. point-to-multipoint, point-to-point and point-to-area)Footnote 1 to be deployed in the band 3650-3700 MHz. 2.1 This SRSP is based on the current or planned technologies considered to implement wireless broadband-type services in Canada. 2.2 Notwithstanding the fact that a system satisfies the requirements of this SRSP, the Department shall require adjustment to radio and auxiliary equipment in radio stations whenever harmful interferenceFootnote 2 is caused to any licensed radio station. 2.3 Radio systems conforming to these technical requirements will be given priority in licensing over non-standard radio systems operating in these bands. The arrangements for non-standard systems are outlined in the document entitled Spectrum Utilization Policies Gen, General Information Related to Spectrum Utilization and Radio Systems Policies (SP-Gen). 2.4 WBS radio systems operating in this band prior to the issuance of this SRSP may continue to operate. 2.5 Revisions to this SRSP will be made as required. The current issues of the following documents are applicable and available on the Spectrum Management and Telecommunications website at http://ic.gc.ca/spectrum. 4.1 The band 3650-3700 MHz is divided into two sub-bands: the lower sub-band 3650-3675 MHz and the upper sub-band 3675-3700 MHz. See Figure 1 for the band plan. * Except in low population areas, see Section 4.1.1 for details. 4.1.1 Equipment using restricted contention protocols (defined in Section 5.3) will only be permitted to operate in the lower sub-band. However, in low population areas,Footnote 3 equipment incorporating restricted protocols will be permitted to operate through the entire 3650-3700 MHz band. In such cases, licensees are encouraged to use the lower sub-band first. 4.1.2 Equipment making use of unrestricted contention protocols (also defined in Section 5.3) will be allowed to operate in both sub-bands. 4.1.3 Note that equipment that is permitted to operate in both sub-bands may include channels that overlap the boundary between the upper and lower sub-bands (i.e. may include a channel that overlaps 3675 MHz). Fixed or base stationsFootnote 4 operating in this band are limited to a maximum equivalent istropically radiated power (e.i.r.p.) density of 1 W/MHz. However, in low population areas, a maximum e.i.r.p. density of 60 W/MHz is permitted. Portable and mobile stations (including those operating in mobile-to-mobile mode) are only permitted to transmit if they have first received and decoded an enabling signal transmitted by a base station. Portable and mobile stations will be permitted a maximum e.i.r.p. density of 40 mW/MHz. Stations will be permitted to use any antenna that respects the e.i.r.p. limits specified. 5.2.1 Different information must be transmitted to each receiver. The directional gain, in dBi, shall be calculated as the sum of 10 log (number of array elements or staves) plus the directional gain, in dBi, of the individual element or stave having the highest gain. A lower value for the directional gain than that calculated in paragraph 5.2.2(i) of this section will be accepted if sufficient evidence is presented, e.g. due to shading of the array or coherence loss in the beam forming. 5.2.3 If the transmitter employs an antenna that operates simultaneously on multiple directional beams and if the transmitted beams overlap, the power shall be reduced to ensure that the aggregate radiated power from the overlapping beams does not exceed the limit specified in paragraph 5.2.2 of this section. In addition, the aggregate radiated power transmitted simultaneously on all beams in all directions shall not exceed the limits specified in paragraph 5.2.2 of this section by more than 8 dB. 5.2.4 Transmitters that emit a single directional beam shall operate under the provisions of paragraph 5.2.2 of this section. Licensees are required to deploy equipment that uses contention-based protocols to manage interference between systems. Contention-based Protocol: A protocol that allows multiple users to share the same spectrum by defining the events that must occur when two or more transmitters attempt to simultaneously access the same channel and by establishing rules by which a transmitter provides reasonable opportunities for other transmitters to operate. Such a protocol may consist of procedures for initiating new transmissions, procedures for determining the state of the channel (available or unavailable), and procedures for managing retransmissions in the event of a busy channel. Restricted Contention Protocols: Restricted contention protocols can prevent co-frequency interference only to radio equipment that uses the same or similar protocols. The IEEE 802.16 standard is an example of a restricted contention protocol. Equipment incorporating such a protocol relies on scheduling so as to avoid interference among multiple transmitters using the same protocol. Such equipment cannot, however, determine whether other equipment using a different protocol is operating co-channel, as it does not employ a sensing mechanism. Unrestricted Contention Protocols: Unrestricted contention protocols can prevent co-frequency interference to radio equipment that uses dissimilar contention protocols. The IEEE 802.11 standard is an example of an unrestricted contention protocol. Equipment incorporating such a protocol listens to the channel before transmitting. If the equipment senses that another radio is operating co-channel, it will not transmit, thereby avoiding co-channel interference to equipment using similar or dissimilar contention-based protocols. Possible interference conflicts resulting from the operation of WBS systems and other systems operating in the adjacent bands may occur even though the technical specifications of both this SRSP and RSS-197 are met. The resolution of interference conflicts should be achieved through good faith discussions and mutual agreement between the affected parties. When conflicts between systems cannot be resolved, Industry Canada shall be so advised, whereupon following consultations with the parties concerned, the Department will determine the necessary modifications. FWA systems operate in the band 3475-3650 MHz in accordance with SRSP-303.4, Technical Requirements for Fixed Wireless Access Systems Operating in the Band 3475-3650 MHz . WBS licensees operating at the power limits specified in Section 5.1.1(a) of SRSP-303.65 are not required to provide a guard band to minimize the potential for interference to FWA systems. 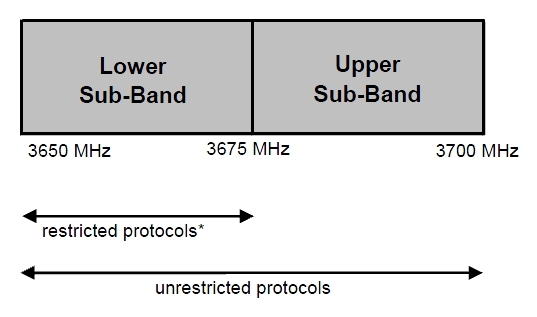 In low population areas where WBS licensees are allowed to operate at power limits specified in Section 5.1.1(b), WBS operators are required to provide a guard band of 5 MHz (from 3650 MHz up to 3655 MHz) to minimize the potential of interference to FWA systems operating in block K. In the event that there are no deployed stations offering service in block K in the same or adjacent geographic area, WBS operators are not required to implement a guard band. Network operators are encouraged to enter into agreements to implement less stringent guard bands while ensuring coexistence among systems. Licensees are required to deploy equipment that makes use of contention-based protocols as per Section 5.3. Moreover, to further reduce the potential for interference and to facilitate shared use of this band, all WBS licensees are required to provide site-specific data and contact information, including any additional information outlined in CPC-2-1-26, to the Department. A licensee shall notify other licensed operators defined in the database and offering service in the same area and in neighbouring service areas, at least six weeks before putting a site in service. Licensees are required to keep this information up-to-date. Although interference may still occur, the Department expects that it can be managed. As such, the Department will not be involved in coordinating station assignments or resolving interference problems between WBS licensees. The resolution of potential interference conflicts should be achieved through good faith discussions and mutual agreement between the affected parties. Detailed information on interference reduction techniques can be found in Appendix A of Radiocommunication Information Circular RIC-67 at http://www.ic.gc.ca/eic/site/smt-gst.nsf/eng/sf09491.html#TOC1_9. synchronizing upstream and downstream transmissions. WBS licensees are required to coordinate with FSS operators when deploying a WBS base station within 150 km of a licensed earth station operating in the band 3650-3700 MHz. See Annex 1 for a list of FSS receive earth stations located across Canada that are grandfathered under SP 3650 MHz – Spectrum Utilization Policy, Technical and Licensing Requirements for Wireless Broadband Services (WBS) in the Band 3650-3700 MHz ( Canada Gazette Notice DGTP-005-09). Canada has concluded an Arrangement with the United States for the sharing of the 3650-3700 MHz frequency band along the border regions. The Arrangement permits the operation of equipment using both restricted and unrestricted protocols and is the basis for shared use of this spectrum in the border area. Final adoption of the Arrangement is subject to the treaty adoption processes of both Canada and the United States. Operators are bound by the following conditions for the deployment of fixed stations in the coordination zone along the border. cannot operate in the band 3675-3700 MHz. can operate in the sub-band 3662.5-3675 MHz, on a secondary basis to U.S. operations. The provisions for low population areas in sections 4.1.1 and 5.1.1(b) do not apply within the U.S. coordination zone. (2) With respect to coordination with FSS stations, any proposed use within 150 km of a licensed U.S. earth station in the band 3650-3700 MHz will require coordination regardless of the type of protocol used. In such a case, licensees should contact Industry Canada to arrange for coordination prior to deployment. Licensees will be subject to any future agreements between Canada and the United States regarding use of these systems in the border regions, which may include obtaining departmental approval before allowing certain stations to operate. The arrangement for this band will be available at http://www.ic.gc.ca/eic/site/smt-gst.nsf/eng/sf01238.html . Return to footnote 1 Point-to-point: A system that establishes a radio link between two end points only. Point-to-multipoint: A system that establishes radio links between a single station located at a specified fixed point and a number of stations located at fixed points. Point-to-area: A system that establishes bidirectional radio links between a station located at a specified point and any number of stations located at non-specified points in a given area. Return to footnote 2 For the purpose of this SRSP, harmful interference means interference that endangers the functioning of a radionavigation service or other safety services, or seriously degrades, obstructs, or repeatedly interrupts a radiocommunication service operating in accordance with regulations and technical requirements laid down by Industry Canada under the Radiocommunication Act. Return to footnote 3 For the purposes of this policy, 'low population areas' are defined as those Tier 4 areas that are subject to the minimum licence fee, as identified in CPC-2-1-26. Equipment making use of restricted contention protocols cannot be deployed in the band 3675-3700 MHz in the U.S. coordination zone. As well, equipment permitted to operate at an e.i.r.p. of 60 W/MHz cannot be deployed in the U.S. coordination zone, see Section 9. Return to footnote 4 A fixed station is a station in the fixed service, whereas a base station is a station in the land mobile service. A fixed station includes customer premises equipment for point-to-point and point-to-multipoint systems. Return to footnote 5 A list of licensed FSS earth station receivers in the band 3700-4200 MHz is available using the "Radio Frequency Search" tools located on Industry Canada's website at http://www.ic.gc.ca/eic/site/sd-sd.nsf/eng/Home. The WBS band is divided into two parts. The lower sub-band runs from 3650 MHz to 3675 MHz and the upper sub-band runs from 3675 MHz to 3700 MHz. Systems using restricted protocols are only permitted to operate in the lower sub-band, with the exception of low population areas as described in Section 4.1.1. Systems using unrestricted protocols may use both the lower and upper sub-bands.